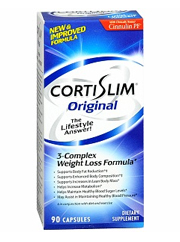 ﻿ CortiSLIM Review: Is it Safe? The Corti in CortiSLIM is meant to suggest how this weight loss supplement series helps prevent the build up of the stress hormone cortisol. When too much stress is felt in the body it can potentially lead to an increase in stomach fat. So this supplement is meant to help you relieve stress and lose weight. Or so it claims. The reason why this review exists is to help you find the difference between this brand and other weight loss products. ThermoDiamine(Evodiamine) - Extract of berries which some believe can increase warmth in the body. Green Tea Extract - An antioxidant rich tea which also has caffeine. L-Theanine - An extract found in Green Tea which promotes relaxation. Banaba leaf - Under researched blood sugar lowering plant. Has all natural ingredients and there are a few different options in the CortiSLIM family. A lot of the ingredients can be found for much cheaper elsewhere. Also it has a lot of caffeine in it which may cause some unwanted issues. One of the big issues of this product is the addition of caffeine. Yes it might give you a boost in energy, but it can also create some nasty side effects. Side effects may include headaches, insomnia, restlessness, anxiety and many others. There really is no need to take a pill with caffeine as you can get a cup of coffee or tea with a more natural form of caffeine. In fact a cup of Green Tea would substitute a good chunk of the ingredients here. There is no doubt that when you take caffeine it will produce some results. The question is why would you take it when it can be supplemented much cheaper with a simple cup of coffee or tea? Though to really make sure how this stacks up, compare and contrast this brand with other supplements with the other options that are available right now. Well the idea of lowering stress to get rid of fat is a useful approach to losing weight. There is no doubt about that. In fact there are some interesting qualities with this brand, it features some natural ingredients which are shown to be good for the body. Green Tea being one of the positive ingredients found here. So you're paying a huge chunk of cash just to take in a mixed up supplement. Also since it comes full of caffeine there is a risk of facing some unwanted side effects that you're better off avoiding. There are more promising items that can work for you. To find the results you demand, check out the most outstanding brands.